‘All babies are yogis.’ Because their chitts have less thoughts. They are in their purest form and the light of God shines in them. ‘The yoga of householder is a very hard yoga. Not for everyone. Be householder saints.’ The yoga sadhana of householder yogis is to live alone among people and to be in desires without desires. Just these four pages were enough at the time to assure me that raising children was a potent form of spiritual practice. But by serving my children selflessly (karma yoga), with an open heart of devotion (bhakti yoga), while living in intentional community (family), I was also renouncing the outer world in a sense, becoming the world for my children. As each year passed their world grew bigger and my role within and without my family began to change. I needed to understand what the practice of householder yoga really meant, why it was considered so difficult, and how ‘to live alone among people and be in desires without desires’. It was noted that the system was set in place to avoid mass renunciation and the breakdown of society, but there were exceptions. Those who experienced complete dispassion towards the world during the student stage could go straight to renunciation (like Babaji). But for the rest of us, the hard work of spiritual sadhana (practice) was, and very much still is, to be found while ‘being in the world but not of it’. I found a helpful passage in Between Pleasure and Pain, written by devotees of Babaji, based on his teachings. “Marriage invariably means family life and all the financial responsibilities that go along with it. We have to earn a living and provide ourselves and our families with the necessities of life. But how do work and family responsibilities fit in with spiritual life? Don’t all the traditional teachings say that we have to renounce worldly possessions? Is this to be taken literally? If not, what is renunciation? Renunciation is something other and much deeper than the mere physical act of giving away one’s car, television set, and stereo, etc., and going away to live in a cave in the Himalayas. Renunciation has virtually nothing to do with physical possessions. It is strictly a state of mind. Renunciation for householders means living in the world without becoming bound and obsessed by it. And worldliness, the opposite of renunciation, is only attachment to sense objects and sense experiences, and not the objects or experiences themselves. Work and household responsibilities are perfectly compatible with spiritual life. Our attitude alone determines whether our lives are “spiritual” or “worldly”. In fact, considering our culture and our needs, household life is undoubtedly the most viable approach to sadhana for most of us. Q: Is solitude preferable to being a householder? B: No, but a householder sometimes needs solitude to see him or herself from a different angle. Q: Is a householder’s progress slower? B: Progress depends upon your honesty. A sadhu (renunciate) can be much slower in sadhana than a householder if there is not honesty in sadhana. No one can have everything. We gain something and we lose something. In this way life goes on. Without developing the qualities of tolerance, compassion and contentment we can’t live together and can’t love each other. A married couple should sacrifice their personal desires and row their boat together. Negativity is not unusual; it exists in everyone. But we have to overpower these negative things by watching the mind. There is no peace if there is no limitation of desires. We create problems mostly by our own dissatisfactions. No one can be happy all the time. Sometimes we get sad and depressed, and at that time our sadness projects onto the people around us, which creates problems or dissatisfaction. I have not seen any householders who can say that they have no problems. I can’t say that householders can eliminate all problems, but they can reduce the emotional strain by understanding the real situation. There is nothing wrong in wanting material things when you are a householder. But when you want material things and at the same time reject spiritual life, that is not good. …Money has its place in life. It’s not the most important thing to have money. With lots of money you can’t eat more than the capacity of your stomach. You can’t wear several sets of clothes. You can’t ride in three or four cars at the same time. Money gives material satisfaction and at the same time dissatisfaction. But you need money to pay your family expenses. The most important thing is peace. Without peace one can’t get contentment. Without contentment life is unhappy and miserable. …We are in the world. We have to desire things we need. But in desiring the world we should also desire to get out of the world. Sadhana is very important. It does not matter what sadhana you do. The important thing is to do it regularly. Wish you all happy together. 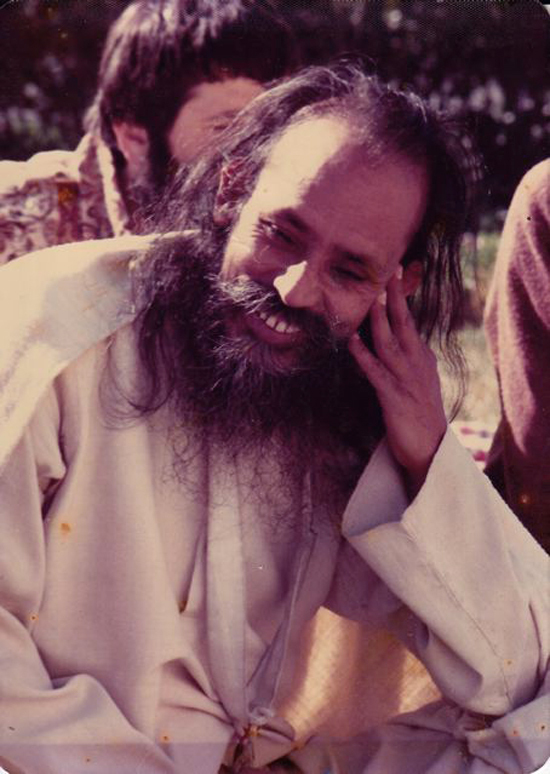 I get the sense that all of Babaji’s teachings are for householder yogis. Over and over again he reiterates that limiting desires is an important part of the path and that regular sadhana supports this aim. The yoga of parenthood continues for me to be a practice of devotion and selfless service, and, as I venture into the wider world of livelihood and community engagement, these practices continue to challenge and guide me. Babaji writes of karma yoga- “Work without devotion is sand” which flows seamlessly into bhakti yoga- “True love is untouched by desire and attachment” “Love is always there when you are not hating”. 2 thoughts on "Householder Yoga"
Kenzie, Thank you so much for sharing your thoughts and the fruits of your research. Tom and I will hope to meet you at the retreat next year, if we are able to travel from New Mexico. This is a superlative treatment of the key subject for many. Thank you very much for covering it so clearly, and with subtle, firm encouragement. Bravo.